There’s no longer any debate about it: South Australian wines are among the best in the world. From regions you’ve probably already heard of (like the Barossa Valley and McLaren Vale), to some you probably haven’t (like the little natural winemakers’ utopia that is Basket Range), the variety and flavours of SA wine simply can’t be beat. That said – as great as it is – wine has always been somewhat of the mysterious older sibling of the alcohol world. If you’re a wine novice, all that talk of tannins and acidity and ‘mouth feel’ can seem a bit impenetrable. Luckily, there are a heap of younger, energetic South Australian winemakers whose focus is on producing wines that are delicious, drinkable – and, above all else, accessible. These aren’t sixth-generation winemakers who were born into the business, but people whose genuine passion for fermented grape juice has led them down the path to creating their own wines. Their wines aren’t for the show room but for the dinner (or lunch!) table, and their common mission is pretty simply stated: to make wines that they themselves would want to drink. And sometimes drink a lot of. RELATED: ADELAIDE’S SMALL BAR SCENE IS BOOMING – HERE’S WHY. Although Taras Ochota’s punk band, Kranktus, split up in 1999, music never left him very far behind. Last year, Taras’ little winery in Basket Range was paid an impromptu visit by Mick Jagger, who popped by one sunny afternoon for lunch and a few glasses. “A couple of Audis cruised up the driveway,” recalls Taras, “and out came Mick. He hung out for about five hours, and sang songs on our old piano”. If that doesn’t sound surreal enough, Tool’s Maynard James Keenan (himself a winemaker) has also dropped in a few times to investigate Taras’ techniques and help press some grapes. 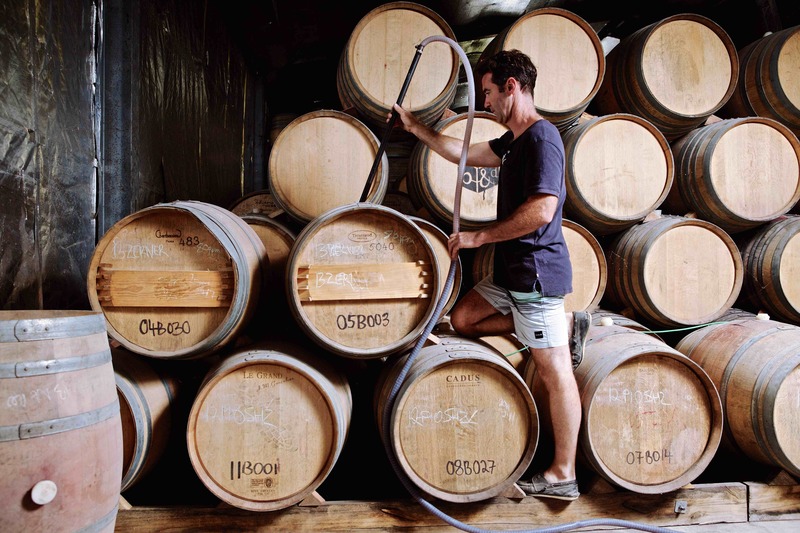 There’s a good reason for this sort of interest – Ochota Barrels’ small batch, holistic wines are crafted with care and close attention – and they are among the most sought-after bottles produced in SA. Ochota was named Young Gun of Wine for 2014, and awarded Best New Australian Winery in 2013. Ochota Barrels’ musical roots run even deeper than just winery visits from legendary rockers: their wines are named after post-punk bands, with the Fugazi Vineyard Blewitt Springs Grenache and Surfer Rosa Garnacha (named for the Pixies’ debut) among their range. But you have to be quick to get your hands on a bottle, as the small runs usually sell out within a few weeks of release. Everything about Spinifex seems as down-to-earth and honest as its winemaker, who started down the road to winemaking from a personal passion. “I don’t have a family background in wine,” says Peter. “Well, I had parents with a reasonable cellar that I used to pinch from,” he laughs. Originally from New Zealand, Peter and his wife, Magali (who now runs Spinifex’s business side of things), moved to Adelaide in the early ‘90s to study winemaking and marketing. After a stint in the south of France (Magali’s family homeland) they returned to the Barossa with a new understanding of the region, ready to make wine. Alpha Box & Dice’s wine labels are so cool they could extinguish a volcano. They’re the type of bottle that you want to leave out on your kitchen counter long after they’ve been drained, just in case somebody who you want to think you’re cool drops by. And – happily – what’s inside the bottle is hugely drinkable, too. The labels come from the impossibly-cool Mash Design, and the wine is produced by the equally-cool Justin Lane. Interested in making wine to be drunk “around the table, by everyday mortals,” Justin’s philosophy when it comes to flavour is simple: he produces wines that he himself would want to drink. On top of this, he wants people to pick up and drink his wine without feeling as if they need to be able to pronounce words like ‘acescence’. Time spent at European wineries was transformational for Justin, who after returning to South Australia in 2008 founded AB&D in McLaren Vale. “[In France], the most memorable wines were not things you would look at in isolation – they were accompaniments, and they were used as tools in an environment like the dining table. Although Susan Yelland has always appreciated a good wine, when she met her husband, Michael Papps, he was strictly a bourbon man. “He didn’t even touch wine,” says Susan. But after hanging around her for a while, Michael decided that he would give this mysterious grape juice a try. “Very quickly he converted from a bourbon drinker to a wine drinker,” says Susan with a smile. The couple’s path into winemaking is anything but the typical Barossa Valley tale – although they’ve now adopted the region as their home, they both initially arrived in the Valley as out-of-towners (“there is a saying in the Barossa that you have to have a grand-parent “in the ground” before you are considered a local,” their website jokes). Neither Susan nor Michael were from winemaking families (or even especially wine appreciating families), and they didn’t have much financial or expert help behind them. “We didn’t have investors – my mum and dad helped out with a few dollars – but we didn’t have anyone really backing us. Really, our wine had to back us,” says Susan. And back them it did – since its founding in 2005, Yelland and Papps’ wines have emerged as some of the Barossa’s most unique (not to mention drinkable) additions of the past few years. “We make wines that we love, and thank god that other people like them… We’re probably making very different wine to most other people in the Valley,” says Susan. Of all the winemakers featured in this article, Delinquente is the smallest and nimblest – Con-Greg doesn’t even keep a permanent winery, instead renting out other facilities when it’s time to get smashing. Even more notably, Delinquente uses Southern Italian varieties grown in the Riverland, which is a region known mostly for its voluminous output of cask wine. Later, while working for an advertising agency in Melbourne, Con-Greg encountered something amazing: a bottle of great-tasting wine from the Riverland. The experience convinced him that it was possible to create delicious, inventive wine in his home stomping grounds. He returned to Adelaide and started Delinquente in 2013. With over 200 cellars doors on Adelaide’s doorstep, you can embark on endless food and wine adventures in picturesque South Australia. Find out more here.